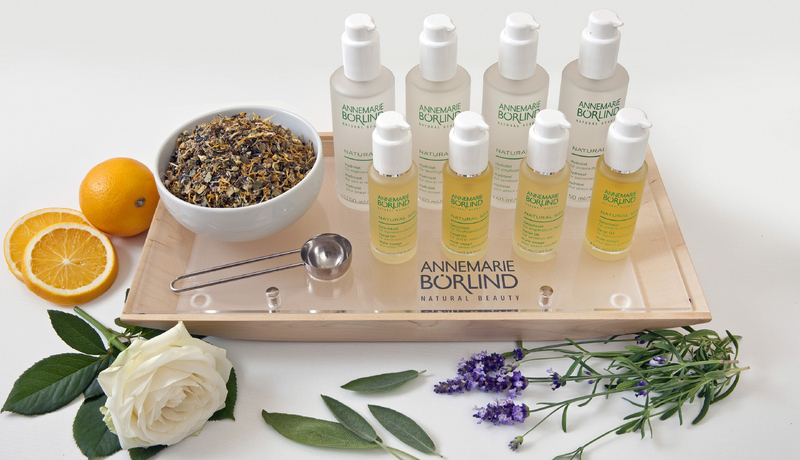 ANNEMARIE BÖRLIND NATURAL SPA is an exceptional salon-treatment concept for the face and body, based on skin care products adapted to the condition and problems of every individual customer’s skin, therefore providing optimum efficacy and making the skin feel remarkable. Products containing natural ingredients, such as valuable, cold-pressed plant oils and waxes, herbal extracts and vitamins, and naturally pure spring water from the Black Forest, combined with special massage and treatment techniques, are the secret behind this completely new SPA concept. The concept is completed by special massage and treatment techniques with products from the ANNEMARIE BÖRLIND “plant bar”. Four different plant oils and hydrosols are deployed, tailored to the needs of the skin and derived from sage, rose, orange or aloe vera, for example. The result is visible beauty care with a system – for all skin types and all ages. Clarifies and refines the skin. Herbal extracts, such as chamomile, sage and yarrow, have been specifically coordinated to meet the requirements of oily, blemished or combination skin. Botanical hyaluronic acid, samphire and active ingredients from the papyrus quench the skin’s “thirst”, invigorate the skin and activate it. Balmint, wheat germ oil and horsetail soothe stressed and sensitive skin and strengthen its natural defenses. The exclusive LL-Biokomplex gives the skin new firmness and tone. The skin’s natural vitality is restored. Valuable marine algae extracts, macadamia nut oil and hyaluronic acid reduce the breakdown of collagen. Lines and wrinkles are smoothed, and elasticity is improved. Offers luxurious essences for particularly demanding skin. The innovative Biolifting complex, containing white truffle, botanical hyaluronic acid and a “cocktail” of vitamins activates the skin’s natural regeneration and cell-renewal mechanisms. For an instant lifting effect.